I absolutely love bronzer and peach looks best against my olive complexion. 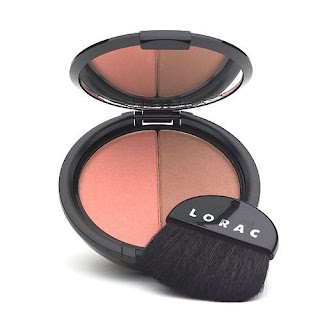 So LORAC Hot & Spicy which is a peach shimmer and a light bronze shimmer is my absolute favorite blush and bronzer. I am sure many of you can relate to the fact that winter takes a toll on the nails. Personally mine become very brittle. Perfect Formula's Daily Moisture is the only thing that is keeping my nails strong and healthy. This is a serum that helps to reduce fine lines, wrinkles and improve texture. Anything to keep my face looking fabulous I am all about, and this is my new favorite product. I have seen a lot of improvement in my skin. I am not big on lipsticks, but sometimes lip gloss just makes me feel kiddish. h.wood beauty definitely understands this and that is just one reason why I am loving their products. I am currently loving the Lip Shine Stick in Poppy. It comes in a lipstick tube however it is almost like a lip gloss just giving you a beauty shine. LOVE IT! I am a long time lipstain lover, and a long time hourglass cosmetics lover so when i saw that they had a cheek stain I knew I had to give it a try. Basically it was the greatest thing to ever happen to my cheeks! What products are you currently loving? those sound like great products! i will definitely be trying the clinique serum! right now i'm loving my cover girl lash exact mascara - it seriously gets every lash! and tarte cheek stain, it stays on all day! I always have wanted to try cheek stain...I love Rosebud lip salve! 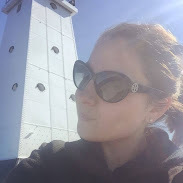 I am still currently in love with Benefits cheek stain, posey...love it! but I would be willing to give your choice of cheek stain a try sometime! enjoy your day!!! I just purchased some of the hourglass cheek stain. It's a wonderful product! I also love Tarte. They make great ones, too. Great picks! I used my St. Ives facial exfoliant on my body the other day and my skin felt like butter!! I am also loving my Bobbi Brown eye cream! I am a big believer in creams and serums esp for your eyes! o0o must try that clinique product... i just bought an airbrush foundation brush from sephora that i am loving! i love that cheek stain! i am loving the Wonder Woman line at Mac right now. I went to the release party and got all made up. I really love the line! i just wish i could be that girl with make up that says more than "i only had 5 minutes to apply foundation and bronzer"
I like the idea of that nail stuff... right now I'm loving my Full 'N' Soft mascara, Too Faced "Snow Bunny" bronzer and MAC Lipglass in "Underage". Pale lips are my favorite! I use Korres serum to even out my skintone but the clinique serum sounds interesting. Does it also even out tone or just texture? I would really like to try that cheek stain...I need a little color cuz I am so pale! I totally need the perfect moisture for my nails! Mine crack and peel like cah-razy! Hope you had a fab week girl! Hooray weekend!!!! i really like lorac products...im going to have to try this stuff out! my favorite products at the moment are definitely tarte's moisturizing lip stains, benefit bella bamba, and ysl lipsticks (have been my favorite's for quite sometime). i also picked up some make up store eye shadows when i was in sweden that i freaking LOVE!!!! cheek stains are great, I love the glow it gives me in summer. 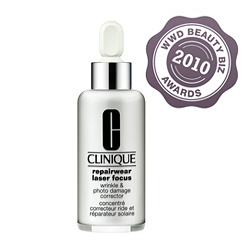 I think I'm gunna go out and buy some Clinique Repairwear Laser Focus! Thanks for the tips! I love that daily moisture product. That sounds like something I need to get! I am loving hair treatments. I did a warm olive oil treatment the other day. Seemed to make my hair softer. great products to know about! I always love my bronzer from bare essentials! I love Philosophy products, lotion, shampoo, cologne, moisturizer, you name it I love it!